It’s known as the toughest, most unpredictable race in the world, and this year’s story certainly demonstrates that, as Sunderland and Walkner not only succeeded in taking the top two positions, but also in their main goal of completing the 12-stage rally for the first time. Both had retired with injury and sickness in earlier editions. Sunderland, who is the first British racer to win the Dakar in any category, went into the final 64 km timed special with a 33-minute advantage aboard his KTM 450 RALLY and, having led the race from stage 5, the 27-year-old held his nerve to take victory after almost 9,000 km travelled through Paraguay, Bolivia, and Argentina while battling with incredibly challenging conditions and difficult navigation. 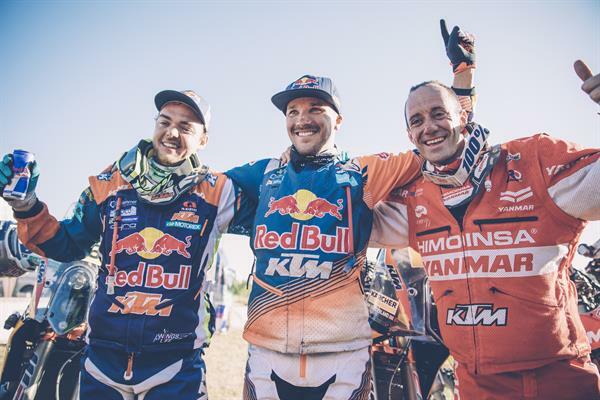 Sunderland’s Austrian teammate, Walkner, had a little more pressure in the closing stages from fellow KTM pilot Gerard Farres Guell, who finished in an eventual third position and Adrien Van Beveren who won the final stage. It was an incredible turn of events for the Red Bull KTM Rally Factory Racing Team, as teammate and 2016 winner Toby Price went out in the fourth stage after crashing and breaking his leg in four places. Following surgery in La Paz, Bolivia, the Australian desert champion has now returned home with the aim of being back on his KTM 450 RALLY machine in four months. Spanish KTM factory racer Laia Sanz, who had a very successful second week after losing time in the first half of the event, wrapped up her rally in an impressive 16th overall, just one place short of her pre-race goal of a top 15 finish. The five-time Women’s Enduro World Champion, Sanz, is the standout woman rally-raid rider.